People go on vacation for different reasons. We go to relax and eat local. The Tuscan farmhouse which we have rented for the week, Ripertoli www.ripertoli.com is the perfect place for this. Once we find the house, we don’t want to leave. Honestly, you don’t have to go far from the house to get some very satisfying meals. To give you an idea of how we spend our trips while staying at Ripertoli, I decided to share a summary of our trip through this annotated agenda. Day One: We arrive at Ripertoli on a Saturday in late October and daylight savings time has past and it is getting dark earlier now. The roads are very dark and winding and I don’t care to drive after dark unless I have to. Tonight, we decide to eat in, relax, and have Ripertoli’s own, Marisa, cook for us. First things first: we are greeted by Marisa, with kisses on both cheeks, who has already started cooking, drop off our bags and rush off to the nearest winery. How can anyone eat without wine? Just as we get back with the wine and a few provisions for the morning, the table is set with the Antipasti, individual plates decorated artfully, centered is a single Caprese-a fresh tomato topped with bufala mozzarella and basil, surrounded by a couple of Bruschetta al Pomodoro-toasted bread with tomatoes, a slice of Bresaola-dried beef, two Crostini’s topped with different pates’ and an artichoke. The Primi piatti-first course – is Penne in a tomato sauce containing garden fresh tomatoes, basil, salt & pepper. The sauce is so simple and yet so good. The next Primi was Ravioli in a truffle sauce The ravioli are homemade and sautéed in a creamy gorgonzola sauce joined by seasonal truffles. The flavors just pop in your mouth. Secondi piatti, or second course is Baked Chicken and potatoes The chicken is quartered and slowly baked with fresh herbs and potatoes. Contorno, which in Italy is usually served last was a simple green salad of mixed salad greens with local olive oil, vinegar, salt and pepper. Everyone fell in love with Marisa and the meal. We unanimously decided to have Marisa cook for us on Tuesday and again on our departure night on Friday. Day Two: I am up before sunrise this morning brewing coffee and taking in the views from the terrace. Words can’t describe the view from this house looking out over the olive grove. Each time, it’s even better than I remember. We go for our morning walk and return as the others are awakening. Pranzo: We make a left out of the driveway and drive 7 km. to Panzano. We have reservations for lunch at Officina Della Bistecca, owned and operated by Dario Cecchini www.dariocecchini.com of the Antica Macelleria Cecchini. Dario is an 8th generation butcher. We arrive at the butcher shop a little early and there is a party going on! 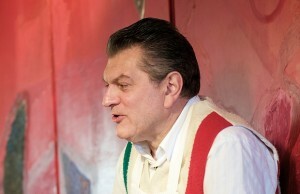 As you enter the shop, the wine is flowing and you are invited to a table of small plates from lardo to porchetta for your pleasure and hospitality from Dario Cecchini. This is a daily thing. It is now lunch time and we are escorted up the stairs through the back of the butcher shop to the restaurant above for some serious food. To a Carnivore, this is the staircase to heaven. Now comes the warning: If you don’t like beef and you don’t like beef rare, run. You are in Tuscany and you can’t choose your doneness. Eat it rare or don’t eat it. Although I’m going to give you the menu in English, I might say it sounds much better in Italian. Garden Vegetables to dip in e.v. olive oil (you still have a chance to run). Beef Tartar, Seared Rump Carpaccio, Bone-in Rib Eye Steak, Porterhouse Steak. 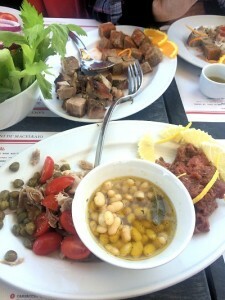 (All of the steaks are cut and passed around on large platters by waiters); Tuscan Beans with e.v. olive oil, Baked Potatoes, Chianti Butter, Tuscan Bread, Vittorio’s Wine, water with or without bubbles, Coffee and Olive Cake, Grappa. Angelo is in charge here and doesn’t disappoint. 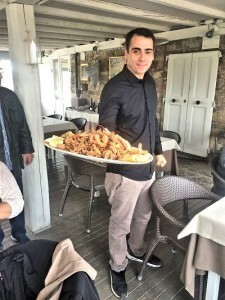 Dario comes up from the butcher shop, holds up two huge Bistecca Fiorentina (porterhouse steaks), and does what I believe is a praise to beef in Italian as everyone is cheering. The only thing I catch in English is at the end of the dialogue he says, “To beef or not to beef.” Dario is quite the character and also a poet of sorts. Needless to say, we didn’t do dinner that night. Day Three: Today we are making a day trip to Florence. 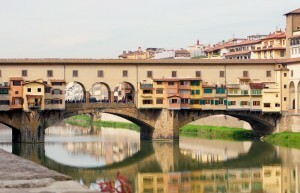 We park and make our way into the city via the Ponte Vecchio. Once we cross the famous gold bridge, we scatter. Some of our group wants to see the Duomo and David. However, I have one thing on my mind and that is Lampredotto. 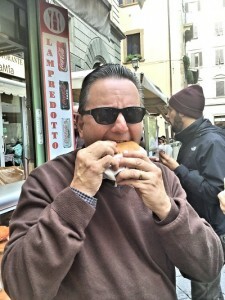 My good friend Lorenzo Giacomelli from Prato tells me that this is the street food that was once a poor person’s and workingman’s sandwich. Lampredotto is a typical Florentine peasant’s dish made from the fourth and final stomach of a cow: the abomasum (Tripe). I see two local police standing on the corner as we cross the bridge and my instincts tell me they could help me with my search. They direct me straight ahead and to the first outdoor leather market on the left and then we turn left. I look down the street and there is a crowd in front of a food truck and I realize this is my destination. I wait my turn and say, “Uno Panini.” My Italian is limited, but I can get my point across for food. The sandwich is stuffed with the Lampredotto and covered with greens, Va Bene! My mission has been accomplished and now we can get on with the sightseeing and shopping. Everyone gathers at our agreed upon meeting place and we make our way back to the cars and Ripertoli. Once back at the house, everyone agrees on starting a fire, opening some wine, and cooking in. This is when having a couple of NYC Firemen along on the trip comes in handy. The kitchen is fully equipped with anything one may need. We made Tortellini in a pesto sauce, Italian sausage along with some leftover Ravioli in a truffle sauce and Penne marinara. Buona Notte! Day Four: From Ripertoli, there are some great walks. Each morning, my wife Charmayne and I start out in a new direction as the sun is rising. We walk to eat. This morning, we turn left out of Ripertoli and right toward Badia di Passignano. I advise not trying this without consulting your doctor because for every downhill there is a very challenging uphill. Don’t even think about running. As you walk, you will see some of the most beautiful landscapes ever. The Abbey in the distance is our destination. As we turn left into the village, we pass a restaurant on our left: La Cantinetta di Passignano, I make a mental note. We pass a few very neatly kept homes, check out the Abbey, and head down the road toward Rignana. We easily make our way down the hill. However, once we reach the bottom, it is all up hill from here…and I mean up hill. We’ll check out Rignana another day because it is all we can do to make it out to the main road and back to Ripertoli this morning. Dario has invited me to his shop this morning to learn the art of making a Porchetta. He was very patient in his lesson, and his wife Kim stood by and did the translating. What a beautiful and sharing couple! I learned a lot from Dario, and I took great pride in adding Porchetta to our Thanksgiving menu this year. Pranzo: We decide to check out Badia di Passignano a little closer and have lunch at La Cantinetta di Passignano www.lacantinettadipassignano.it. To everyone’s surprise, they have a wide selection of seafood on the menu and that appears to be their specialty. The table of three sitting next to us order a fried seafood antipasti that is large enough to feed the whole dining room and they are more than happy to share. It’s a beautiful presentation of assorted seafood lightly fried to perfection. Some of us at our table start with a salad, very American. Italians prefer the salad after the meal. 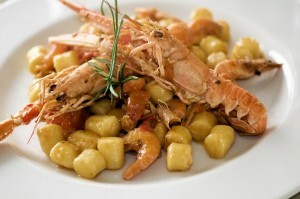 A couple of the standout dishes at our table are the Linguine with Lobster and Truffle and the Gnocchi with Shrimp. Both of these dishes are garnished with the shells of the shrimp and the lobster. No one is disappointed, and we were all amazed to find such outstanding seafood dishes in this location. I live by the ocean in the US, and we have nothing to even closely compare. After lunch, we drive around and check out some more neighboring villages and head back to the house. Marisa is already there preparing dinner. Primi Piatti: Spaghetti with mussels and Mushroom Risotto; Secondi Piatti: Fried Veal Cutlets and Fried Chicken nuggets with tater tots ( who would have thought); Contorno: Boiled Zuccini, Carrots, Green Beans and Fennel. Totally satisfied again! Bravo Marisa!! Day Five: After our walk today, we have an invitation to sample the Porchetta we prepared yesterday. 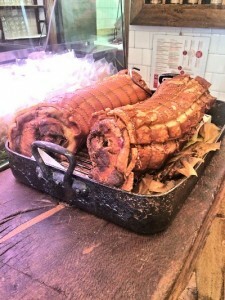 Dario likes to let the Porchetta cool overnight and serve at room temperature the next day, very traditional. His wife Kim likes it hot out of the oven. Me, I’ll take it any way I can get it. We arrive at the shop at 9:00 am and there is Dario greeting us with a big smile. We are poured glasses of Chianti and then he slices and dices the Porchetta for us and puts some mustard and a hot pepper jelly on plates for us to dip. What a way to start our day! Molte Grazie Dario and Kim! 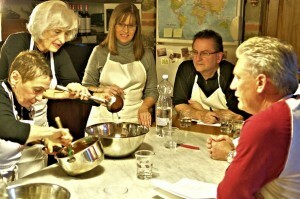 Cooking Class: I have arranged for us to do a cooking lesson with Simonetta Palazio at her home in Adine in Chianti www.adineinchianti.com. Welcome to Adine! Located in the heart of the Chianti Classico region of Tuscany, Adine is a small medieval village made up of just five houses and a tiny church. We have stayed with Simonetta and participated in her cooking classes twice in the past and wanted to share this experience with our group. Today Simonetta is accompanied by Chef Ellisa, a former NYC actress and part-time resident of Adine. Ellisa is very entertaining and Simonetta lets her do most of the instruction…Simonetta’s way mind you. They are very cute and work well together. Antipasti: Zucchini Flowers fi lled with ricotta. We all get to help stuff and, to my surprise, they are baked instead of fried. I must say, it’s a much healthier version and very tasty. Primi: Risotto alle Pere e Gorgonzola (Risotto with pear, gorgonzola and walnuts). This is where I picked up the most tips on the proper way to make Risotto, just when I thought I knew everything. Secondi: Arista Pillottata (Roast Pork, center cut with the bones cut away, but still attached, pierced and stuffed with fresh rosemary, salt and garlic). Contorno: Cipolline in Agrodolce (sweet onions sautéed in butter and olive oil, sprinkled with sugar and vinegar). Dolce: Delizia al Cioccolato (Lindt’s 70% dark chocolate made into a mousse and poured into a shell of ground hazelnuts, sugar and butter). Everyone had a hand in this meal and, once complete, we all sat down at the table to enjoy. Tutti a tavola a mangiare! Day Six: We all decide to spend some time in Greve this morning and do some shopping. Today the main square is empty where, earlier in the week it was full with an outdoor market. The square, or Piazza Giacomo Matteotti is surrounded by a variety of shops and once again we scatter with an agreed upon time to meet for lunch. We can’t miss a meal now, can we? My wife and I stroll around picking up a few gifts and then I spot it, the Antica Macelleria Falorni. This store is a meat lover’s mini mall. It takes up numerous store fronts and has every kind of Italian meat and salami known to man displayed. They are hanging from the ceiling, in deli cases and packaged on shelves. They even offer a salami tasting and a cheese cellar. Now if we could only bring meat products back home with us?! (I was already busted for that last year and customs confiscated my guanciale). After a successful shopping spree we all meet and must decide on a lunch choice. Of course everyone looks at me. I already knew where we were going, Cantinetta di Rignana. Rignana, is back near Ripertoli. As you turn left out of Ripertoli’s driveway it would be your second right. This is the dirt road that we climbed out of on one of our walks. No one can believe that there would be a restaurant up such a road and wonder where I am taking them. After a long bumpy ride, there it is and the parking lot is full. We have a short wait as they set up a table for us overlooking the vineyard. The view is breathtaking and, once again the food does not disappoint. This restaurant is about the meat. We start out with a mixed charcuterie which is a picture of Tuscany. Then, Bruschetta al Pomodoro, Bruschetta al Fagioli and a Caprese which I have to say had the best Bufala Mozzarella we have had yet. 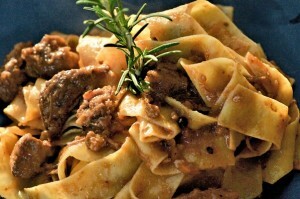 I order Pappardelle with a Boar Ragu. I also see on the table Tagliatelle with Meat Ragu as well as Ravioli with Truffles and we all share a Steak with Capers followed by a green salad with shaved cheese. 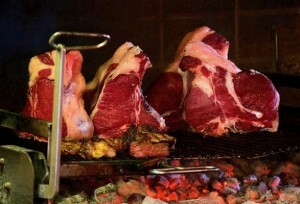 You have to admire the Bistecca Fiorentina’s as they pass by the table. Dolce: Canoli, Tiramasu and Cantucci with Vin Santo. What a wonderful way to spend the afternoon instead of in some museum! I really need to walk back from here but I would never be able to roll uphill. I think we skipped dinner tonight but I don’t remember anything until I came out of the food coma the next morning. Day Seven: This our final day in Tuscany. Although, most of our group decide to visit Sienna, Charmayne and I decide to hang back. We know we are going to get enough of the city life when we head back to Rome. Today, we want to walk the trail from the back of the house to Greve. In our minds, we know this can’t be too tough. We did it two years ago and there is a sign pointing down the trail to Greve. It is a gentle walk down hill with some amazing scenery. However, we hit a fork in the trail. Do we go right or left? Although our choice is incorrect, we come out at the Castello di Verrazzano, family of Giovanni da Verrazzano, the navigator and discoverer of the bay of New York, namesake Verrazzano Bridge. This is a good place to be lost though. We ask directions from an American couple touring the estate and they inform us that we are a long way from Greve. No problem, just point us in the right direction and we’ll get there. After walking a couple of miles the same couple drives by and offers us a ride. I hate to quit the adventure but we are supposed to meet our friend and photographer, Bobby, who also hung back, in Greve and go to lunch with him. We accept the ride and have a pleasant conversation with this couple from Michigan who are staying on the opposite side of Greve. Here we are in the Piazza Giacomo Matteotti once again. 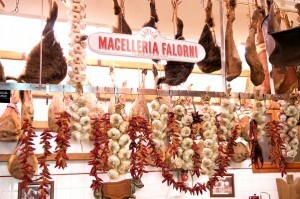 We arrive a little early and I decide to have another peek in Antica Macelleria Falorni. I can’t get enough of this place. We meet Bobby and decide to check out Dario’s in Panzano again for lunch. Today we eat outside adjacent to the Officina at Dario Doc. Dario Doc’s has three lunch offerings to choose from which are very reasonably priced. Charmayne orders the Mac Dario, a half pound burger in a crisp crust served with fresh tomatoes and sliced onions. Bobby and I order the Accoglienza: Beef Tartar, Chianti Tuna, which is actually a pork dish but looks and tastes like tuna, Porchetta and Meatloaf with bell pepper sauce with all the sides. Now, to walk it off. We walk up and tour the rest of Panzano which we are told by the Wine Guy sitting next to me at lunch sits on Chianti’s Gold Bowl. All of the great chianti vineyards spread out here. We get some great photos and as we are walking back to the car, we run into (once again) the couple from Michigan, who now are asking us for directions! What a small world it is. We arrive back at Ripertoli late in the afternoon and Marisa is already there preparing our final meal. She has uncovered a large pork roast separated from the bones. This is a sight for sore eyes. The rest of our friends are also arriving from their day trip to Sienna which they all thoroughly enjoyed. We open the wine and share our days with each other. 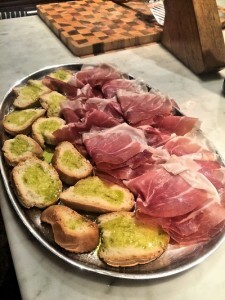 Tutti a Tavola; Antipasti: a tray full of Prosciutto and Crostini topped with Marisa’s own olive oil. Primi: Lasagna Bolognaise and Ravioli in a Butter and Sage sauce, the praises are already going out to Marisa. 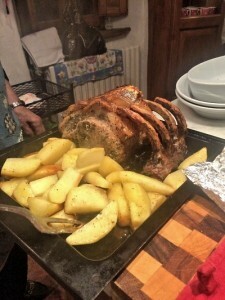 Secondi: the Pork Roast is a picture, arranged alongside the bones and joined by large sliced and roasted potatoes in the same juices. Marisa saved her best for last and we are once again more than satisfied. I find a comfortable chair in front of the fireplace and the rest is history. 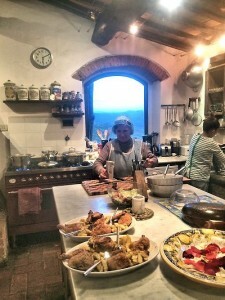 Synopsis: This has been our 4th trip to Tuscany staying in a farmhouse and our 2nd time at Ripertoli. We would like to, once again, thank Deborah and Nigel for giving us this opportunity by sharing such a beautiful property. Tomorrow morning we are heading back to Rome for another adventure which may include some great meals as well. Tuscany will always stand out as one of our favorite Italian destinations for its beauty and giving us the opportunity to unwind from our busy lives. Ripertoli has all of the offerings that we are looking for and I proved that you don’t have to go further than 5 miles from the house to find some outstanding food. I would be happy staying right there and having Marisa cook for me every night. My final conclusion: Italian food is simply growing and sourcing food locally, wherever you are…involving simple, fresh, seasonal ingredients prepared with traditional techniques that have taken years to develop.